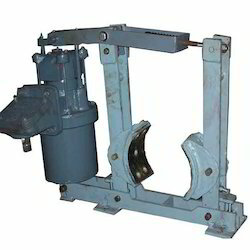 We are Manufacturer and Exporter of Thrustor Brakes. We are manufacturing, trading and supplying Thrustor Brakes. The braking pressure to the shoes is transmitted from the springs by means of an extremely rigid and simple lever/tie rod mechanism. Braking is smooth and positive. The release of the brake shoes effected by energising the 3 phase thruster which overcomes the spring force and the shoes are moved clear of the drum by the lever/ arm linkage system. The angle of the brake shoe being 700 makes the replacement and maintenance of the brake shoes easy at the site.